Nikon’s new MM-200 Measuring Microscope is compact and lightweight with an affordable price for all who require precision and accuracy for measuring a variety of metal, plastic, and electronic parts in all industries; especially automotive and electronics. 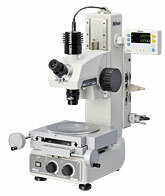 This powerful new microscope is especially designed and engineered with the machining engineers and inspectors in mind. The MM-200 features a space-saving design with a footprint of just 420 x 297 mm (main body with monocular eyepiece tube). In addition, the system weighs just 40kg. Focusing motion control mechanics is newly designed to optimize the use of frequently used objective lenses from 1x to 10x. No stage installation work is necessary and the footprint has been reduced by 50% compared to existing Nikon MM models. For those who prefer to measure with their own eye, the monocular eyepiece tube is available, while the C-Mount Video Head model provides easy video monitoring. The stage lead screw is sealed in order to protect the MM-200 from contamination generated from the adjacent machinery on the production floor. No halogen bulb needs to be changed and light source running cost is reduced since both diascopic and episcopic illuminators employ a high intensity white LED light source. In combination with Nikon’s digital still camera, the DS-2Mv, the new E-MAX series software provides state-of-the-art image processing technology. Automated edge detection with sub-pixel processing enables more precise and repeatable measurement. Effectively used in conjunction with the MM-200, the new E-MAX series software provides the user with various advanced measurements and processing functions, ranging from two-dimensional data processing and image measurements, to data storage. The built-in episcopic and diascopic light sources are all long life white LED. The optional LED Ring Lights will produce clear and enhanced edge contrast by oblique and 8-segmented individually ON/OFF lighting. The MM-200 has the backpack control interface unit for XY stage scale readout, illumination control, communication ports to external devices such as PC, digital readout and more. Simply apply the DP-E1 Data Processing Unit to intricate GD&T measurements. The E-MAX DS-V system allows easy-to-use advanced video edge detection technologies. Popular digital readout instruments, such as Metronics Quadra-Chek300, are also available. The DP-E1 Data Processor is compact, yet easy to use for quick measurements and data processing. The DP-E1’s seamless interface to a PC platform, makes it easy to perform computations and management of your data. The MM-200 can be used with Metronics Quadra-Chek and other 3rd-party digital readouts for Geometric Dimensioning & Tolerancing.